Amani Burke hadn’t scored for the entire fourth quarter before she made the shot. Burke lead Ohio in points heading into the fourth, but as the quarter wound down, Ohio was up by two points against North Carolina A&T. Just over a minute was left. The Bobcats needed the win to end non-conference play well. They had lost four of their last five games. With under a minute left, Burke hit a 3-pointer after Ohio’s 30 second timeout. Burke’s 3-pointer was the clincher the Bobcats needed, and they beat the Aggies 72-65 on Thursday in The Convo. Burke averaged 16.2 points per game in the previous four games before she and the Bobcats played the Aggies. Despite averaging 10.8 points per game in the first six games, she’s been the consistent scorer the Bobcats have needed. Because a consistently productive offense, not defense, has been what the Bobcats have searched for in this first half of the season. The Bobcats found their offense against the Aggies through gaining as many possessions as possible. Coming into this game, the Bobcats needed to prevent the Aggies from dominating the rebounding battle. The Aggies are ranked No. 5 in the country for offensive rebounds per game (18), but the Bobcats held them to five. The Aggies also average 43.4 rebounds per game, and the Bobcats average 31.2. Both teams had 33 rebounds on Thursday, though. Boldon also said that the Bobcats had a good week practicing competing for rebounds. But with the Bobcats fighting for rebounds, that only helped the offense succeed. Burke led the team with 18 points, but freshman Cierra Hooks had 14 points; freshman Gabby Burris had 11 points. Hooks and Burris came off the bench, but Burke’s steady scoring pace throughout the game helped the Bobcats maintain their lead. Aside from Burke’s and the team’s recent offensive uptick, what’s been important is that Ohio remains one of the best defensive teams in the country. The Bobcats have the top turnover margin in the country, and they forced the Aggies to commit 32 turnovers. The Bobcats are regularly in games because of their defense. 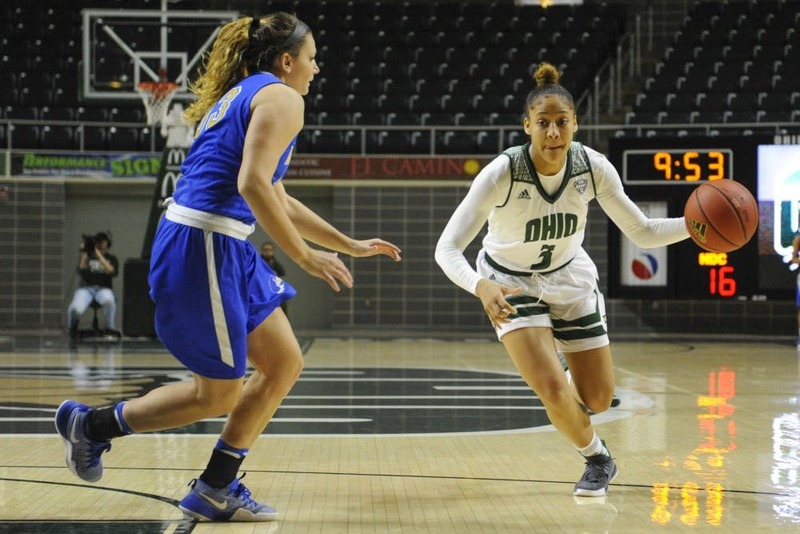 But Boldon knows that as the Bobcats head into MAC play, creating a productive offense, one where shots fall regularly, will be a significant factor in Ohio’s success. Before the game against the Aggies, the Bobcats shot 40.6 percent from the field and from the 3-point line in the previous three games. Ohio’s shooting numbers against Purdue helped bump up those numbers, but the improvement is still there. In its first seven games, the Bobcats shot 34.8 percent from the field and 23.4 percent from three. Ohio (6-5) will start MAC play against Toledo (9-3), the reigning conference champions, Sunday in The Convo at 1 p.m.
“To get back on the winning side of things I think makes everybody feel a little bit better as you prepare for a very tough Toledo team,” Boldon said.